The day is here. Today is the deadline for Hidalgo County Commissioners to do the right thing and to place on Tuesday’s Hidalgo County Commissioners court agenda an item to rescind the appointment of Precinct 1 County Commissioner David Fuentes’ uncle to the powerful Hidalgo Regional Mobility Authority Board. If no item is placed on the Jan. 30 agenda by close of business today, then it likely will not make the agenda and therefore could not be an actionable item on Tuesday at the next Hidalgo County Commissioners meeting. State law requires the agenda post 72 hours in advance of the meeting, but county staff usually send it out by the Friday evening before the meeting. So we are calling on commissioners, and County Judge Ramon Garcia, to do the right thing today. On Jan. 9, Fuentes nominated his uncle, Ezequiel Reyna Jr., a Weslaco-based developer and lawyer, to the RMA board. Hidalgo County Commissioners then promptly voted to approve the action. And despite Hidalgo County lawyer Steve Crain’s advice to Fuentes and commissioners that legally there is nothing amiss with the appointment, we all know that ethically it would be a terrible mistake — not only for Fuentes, but for the entire Rio Grande Valley. We have written several editorials already calling on Fuentes to reverse this action. We have noted the cronyism and corruption the RGV is known for and how this would play in to that stereotype. But Fuentes has yet to take it back. If commissioners do not rescind the vote on Jan. 30, then Reyna could begin his appointment when the new RMA board term begins on Feb. 2. We certainly hope that commissioners aren’t planning on brushing this issue under the rug until it’s too late to rectify? What more do we need to say about how improperly it is perceived to put one’s own uncle into such a powerful regional position? Reyna might not be paid — which Crain says must occur to fall under state nepotism laws — but the perception by the public is that Reyna would undoubtedly benefit from it. The Hidalgo County Regional Mobility Authority Board holds the purse strings for an agency that last year administered revenue on over $40 million of taxpayer funds for transportation plans. Each of the seven board members are quite powerful. It is undoubtedly one of the Valley’s most prestigious boards, stacked with heavy hitters. It might tend to fly under the radar (possibly on purpose) but one look at the make up of this powerful board of trustees should convince anyone of the collective power and influence this group yields: Chairman S. David Deanda Jr., Alonzo Cantu, Forrest Runnels, Ricardo Perez, R. David Guerra, and Paul Moxley. 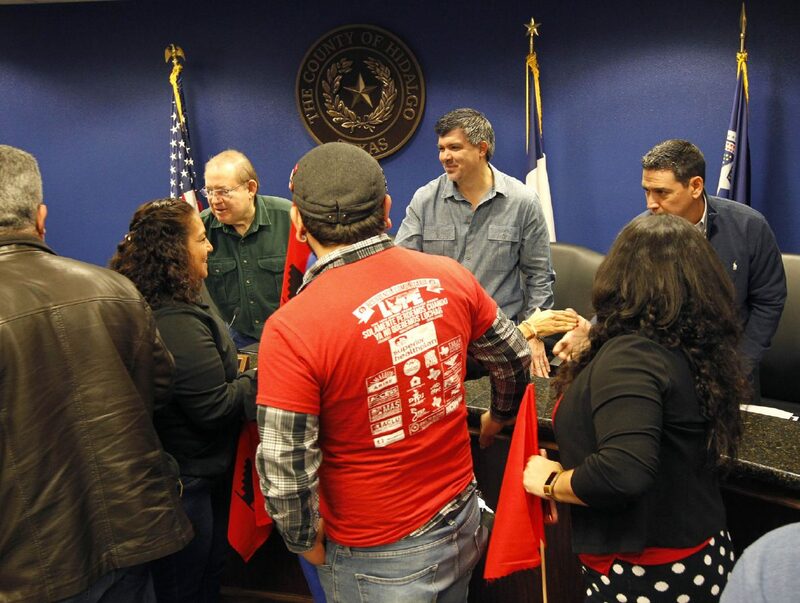 We applaud the RMA board for not swearing in Reyna during their Jan. 23 meeting, citing that the county officials had not yet given the go-ahead. But RMA officials tell us that if they get the go-ahead and the vote is not rescinded then Reyna only need go in to their offices, fill out the proper paperwork and he can get sworn in on the spot for the two-year term. Don’t let that happen, esteemed county officials. You all know right from wrong.